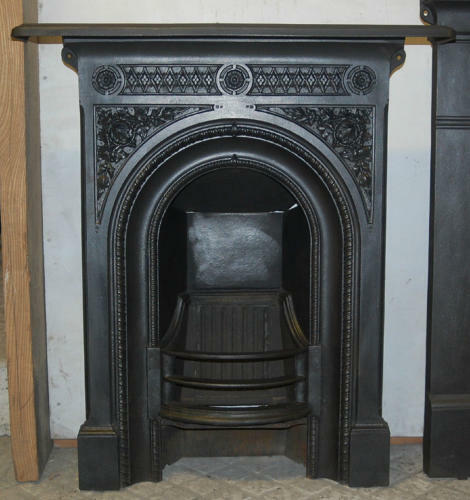 A very pretty, ornate, Victorian cast iron combination bedroom fire. The fire features a diamond design on the crossbar, with flowers set in to circular borders. The corners of the fire have triangular panels with a delicate leaf pattern. The fire has heavy rope borders around the fire opening and the inside edge of the legs. The curved front bars are present and the grill and concrete back are intact. The fire does have a smoke flap but it is slightly too large. If purchaser would prefer we can supply a ply flap, sprayed black, please let us know at time of purchase. The fire does not have an RD number but has FALKIRK and an item number on the reverse under the mantel, relating to where the fire was made. The fire is of a good size, perfect for a bedroom or small dining or living room. The fire has been blacked and polished and has a rich colour and finish. The fire is antique and therefore has some slight signs of use and wear. The fire has some light scratches and casting marks. There are some smudges to the finish on the mantel and mantel edge. There is some surface rust to the grill, under the grill, on the bottom front bar and legs. The back has surface rust as expected. The fire has a fantastic, attractive, design that would work well with period or modern interiors, providing great style and character to a home.